Cadbury Schweppes in Australia is promoting the Favourites collection of chocolates with a visual effects driven television commercial using music by Canada band Broken Social Scene. 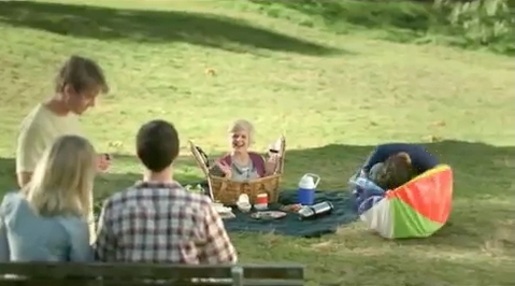 A man sits on a park bench with an “esky”, an Australian chilled picnic box. People start climbing out of his esky, bringing with them the makings of a shared picnic: a rug, a parasol, food, a portable swimming pool and lots of people. For some strange reason all online copies of the video have a lighting treatment that picks up rays of sunlight. The Cadbury Favourites campaign was developed at George Patterson Y&R, Melbourne, by creative director Ben Coulson, creatives Chris Northam and Simon Bagnasco. Filming was shot by Kris Moyes via Revolver, Melbourne, with executive producer Michael Ritchie, producer Caroline Barry, and director of photography Jac Fitzgerald. Editor was Stewart Reeves at Guillotine. VFX were developed by Leoni Willis at Animal Logic .